Dagobah is located in the distant Sluis sector of the Outer Rim Territories, over 50,000 light years from the Galactic Core. The numerous failed colonization attempts of Dagobah have given it a reputation of being cursed or haunted. Its gloomy surface does little to dispel such notions. 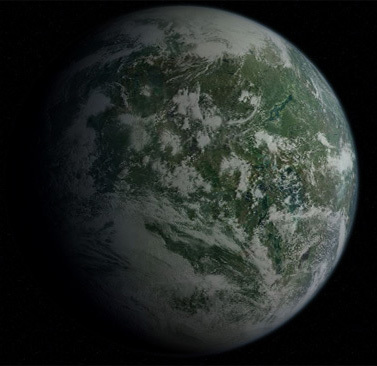 A distant, mist-shrouded swamp planet, Dagobah does not appear in any modern starcharts. It is a forgotten world, and it was the home of the last remaining Jedi Master and Council member from the waning days of the Republic. The planet is covered in gnarled trees and fetid swamps. Huge lagoons are home to fearsome snakes and other creatures that swim in the murky waters. Leathery-winged avians take to the fog-filled skies. Though the planet has no signs of technology, its life form readings register as massive. During the days of the Republic, a scouting expedition spearheaded by the scout Halka Four-Den was met with recurring hazards from the swamp world. After thirteen weeks of roughing it in the wilderness, the expedition was declared a failure and Four-Den sent out a distress signal. Rescuers arrived too late. Though Four-Den's records were found, there was no trace of her or her crew. Years ago, a group of Jedi in the neighboring Bpfasshi star system went rogue and succumbed to the dark side. Jedi Masters were sent to stop this dark Jedi insurrection, and one of the fallen Jedi escaped to Dagobah. Though circumstances are unclear on what transpired, it is believed a dark Jedi died on Dagobah, and the local flora absorbed his twisted energies. In the first year of the Empire, the scout Keog Boorn continued in Four-Den's footsteps. The superstitious scout barely had time to complete a standard survey, as he fled the fearsome planet, marking it as not worth the effort of colonization. From these scattered attempts comes the official names of Dagobah's bizarre wildlife. The gnarltrees that cover much of the planet's land have a fascinating life cycle, beginning as ambulatory knobby white spiders which take root to grow into trees once achieving a certain point in their lifespan. Other creatures include the butcherbug, which spins deadly razor-sharp webs, the dragonsnake, and the swamp slug. After discovering the disappearance of the planet Kamino from Jedi navigational charts at the beginning of the Clone Wars, Yoda discreetly scanned for other gaps. Throughout the entire galaxy, he detected 37 more "missing" star systems. With the dark side of the Force ever more pervasive, Yoda chose to keep one lost planet, Dagobah, as his private secret. Following the scourge of the Jedi by the emergent Empire, the Jedi Master Yoda fled to Dagobah aboard an escape pod and went into hiding. A world plagued with overgrown jungles, creatures, and constant rain, it was a perfect place to hide. Few would ever come to such a planet willingly. The young Jedi initiate Luke Skywalker journeyed to the bog planet, prompted by a message delivered by the spectral image of his late master, Obi-Wan Kenobi. Though Luke lacked the navigation data to journey to Dagobah, he was able to puzzle its location through the Force. Upon arrival in the upper atmosphere of the planet, Luke's X-wing starfighter was buffeted by strong winds and fierce electrical storms. His instrumentation died, and Luke crashed into the swamps. Perhaps it was a natural phenomenon. Perhaps Yoda coaxed the storm from the skies. Either way, Skywalker had landed close to Yoda's simple mud hut, and soon began his training. The constant rains and teeming wildlife made Skywalker's grueling training all the more arduous. A vision of his friends in pain prompted Luke to abandon his training, and he left Dagobah. He would return months later, to discover an ailing Yoda and to learn more about his destiny as the son of Anakin Skywalker. Years later, despite its discovery by other agents and failed scouting expeditions, Dagobah was actively kept mysterious by Luke Skywalker. He purged any information regarding Dagobah's relation to the Force from the New Republic's databank. Its general planetary information, however, remains intact.